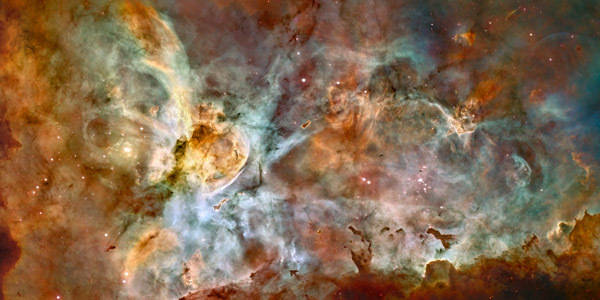 Also known as the Great Nebula in Carina, the Carina Nebula is a large, bright nebula that surrounds several open clusters of stars - such as Eta Carinae, two of the most massive and luminous stars in the Milky Way galaxy. Carina is between 6,500 and 10,000 light years from Earth. It appears in the constellation of Carina, and is located in the Carina–Sagittarius Arm.